One of the first home infused aperetifs I experienced in France was Vin d'Orange. My mother-in-law Brigitte does it every year, as did her mother. Where they live, Seville oranges, otherwise known as bitter oranges, grow in a whole lot of people's gardens and the fruit gets passed from hand to hand, distributed out from one person to another throughout the month of January and February. Certain towns in the Var have them growing in the streets. A lot of grocery stores in the cities have them when they come into season, and they turn up at the market as well. You can ask just about any French person you know if someone in their family does Vin d'Orange, and almost invariably the answer comes back yes. You won't normally find this apéro for sale, people just give bottles of it to each other. The apérétif is strained into bottles after only one month of maceration time. It lasts a really long time, but we usually use up our bottle within a few months after Brigitte gives it to us. I had been married to Loic for about 2 1/2 years when Brigitte opened up her kitchen notebook to me. She was cooking dinner and I was looking for something to do. I settled in at the kitchen table and began translating my favorites from her own handwritten book. We had a glass of wine together and talked, and I asked questions about this or that recipe. I have since passed this particular recipe on and continue to get letters and notes of thanks from as far away as San Fransisco for it. It originates from Mireille Durandeau of Toulon in the Var, with a few notes from her daughter Brigitte. - A kilo of Seville oranges is about 6 or 7 oranges. - If you don't have eau de vie, you can use any good vodka or anything with 40% alcohol or 80 proof. 1/2 liter is about 2 cups. Remember that this is a simple recipe so try and use something neutral. - If you don't want to break out the grinder or cringe at the thought of cleaning it, give it a few pulses in the food processor. That's what I do. - Since Brigitte gets her wine from the co-op at St. Cecile de Vignes, she measures out 2 liters exactly, but for those of us who buy our wine in bottles, you have to use 3 bottles of wine, minus 2 glasses. That means open 3 bottles, pour one glass for yourself and someone else, and use the rest of the wine. - Use granulated sugar. 750 grams is equal to about 3 1/3 cups. I post this recipe as an idea for this talented card designer and blogger who shares with us the story of her quest for the Seville orange (her holy grail of the moment) in Vancouver, wherein she finally finds some. So ok universe, message received...vin d'orange, I'll give it a whirl!!! I have never tried this, even after many holidays and vacations spent with French families. A new little quest. But I have been quite spoiled with different regional treasures during various trips. Next goal- try as many specialties as possible during the semi-business trips to the Rhone-Alpes regional parks. Chartreuse anyone? thanks for the idea! 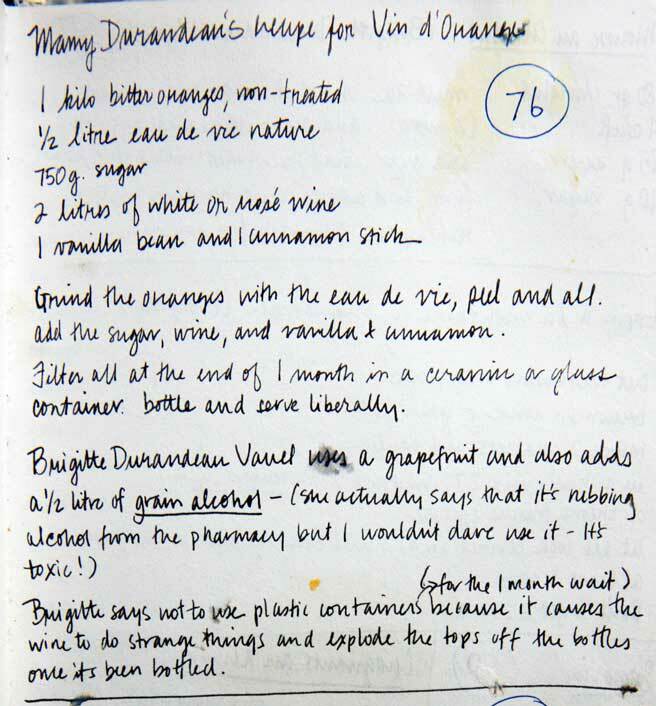 this vin d'orange looks lovely and i love that you included the hand-written recipe! I was so intrigued when you first posted this recipe elsewhere. I was introduced to vin d'orange in a little boîte in Aix and immediately fell deeply in love. I tried making some when I got home (with disappointing results, naturally – what did I expect from silly old navel oranges?). Seeing your recipe again, I'm deeply inspired, but where to find Seville oranges? Well...a Google search turned up an orchard in California (ripetoyou.com) that grows and ships a stunning variety of unusual citrus (Buddha's Hand! Calamondin! Bergamot! Limequats!) including Seville oranges. I was all set to order a 15 lb. box, reasonably priced at $30; I thought I'd make the vin d'orange and use the remainder to make marmalade. But as I clicked through the purchasing sequence and got to shipping costs...$53!!! Oh, well. I have another option to explore...a local restaurant that gets weekly deliveries from a specialty produce purveyor down in Massachusetts. If that fails, I'll just have to stick with the vicarious delight of reading about yours. Tace, do try it, it actually is much easier (well less messy to do) than vin de noix and takes less time. Francine, better yet, why not send the recipe to your mother so that when you get there the Vin d'Orange will be ready? Gina Louise, there are so many things to try. You're right, we should always seek them out. Kickpleat, I certainly hope that this recipe makes its way into your own recipe list of things to do in winter with the "marmelade oranges" from the Asian food market. GG, at first I thought, hell, why don't I send some over? Then I remembered that it wouldn't get through customs. Maybe you could check out the Asian shops in your area? Kickpleat hit the paydirt while searching there. Oh my....This looks like something that will be brewing in my kitchen very soon. What a beautiful post. I love these things that aren't available in stores, but merely passed from one to the other. Thanks for passing on your family recipe to us. I feel like I'm a part of a special community. Toni, thanks for coming by. There is a whole lot of good karma in this particular home brewed aperetif, that's for sure. Maya, why certainly! The bitter oranges with green skins growing in your garden could produce marvelous results. And coming from your garden is just right in the spirit of this drink. Just a big jar will do fine. While you can get alcohol from the pharmacies to use in this recipe, do NOT use rubbing alcohol - it has menthol added to it to make people sick if they drink it. Explain to your pharmacist that you are going to do the recipe and ask if they have alcohol for something people are going to drink. Hi Lucy, when you say Mme Durandeau also adds 1/2 litre of grain alcohol do you mean in addition to the eau de vie or instead of? I have just found a couple of kilos of Spanish bitter oranges from Seville at our local market so am excited to get down to making my first batch of Vin d'Orange. Thanks, Niamh from Dublin, Ireland. I mean instead of. Oh have fun! Thanks Lucy, so looking forward to getting on with it! Thanks for the recipe - just finished a batch! Does the cool dark place it sits matter? I guess what I'm asking is if the refrigerator is fine? So glad to find a use for the Seville orange tree that came with our house. We thought it was useless! Our friend who lives near Beziers gave us a bottle of his own delicious vin d'orange when we visited. When we asked if he would share the recipe with us he went very uncharacteristically quiet. He makes a lot of it and trades it around the village. 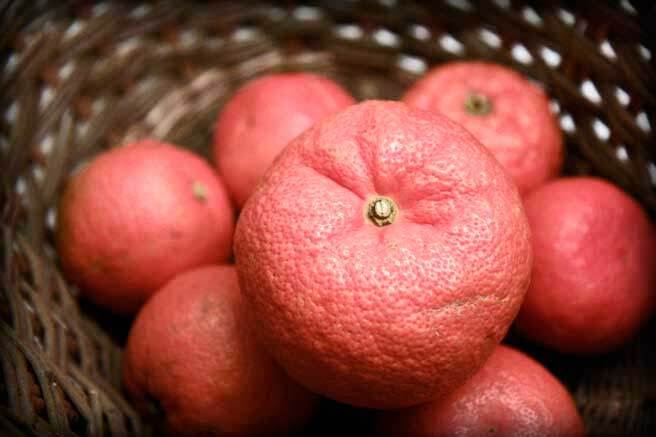 His recipe is not the same as yours - his house was full of trays of Valencia orange peel drying for his brew, and we know he uses rose wine as a base, but that's all the information we could glean! There must be almost as many recipes as there are makers. We're very glad to have this recipe so we can have a go, as he's a long way off and doesn't ship internationally. Just about to start this year's Vin d'Orange. Last year it was a great success, although it did have a LOT of sediment. Just wondering how you filter yours? We used coffee filters but they blocked up so quickly that they were useless, we eventually used a muslin jelly bag but were still left with quite a bit of sediment. Once the sediment settled the Vin was clear and beautiful, and of course, delicious. Any suggestions for this year? I hope you are well and happy and enjoying some signs of Spring. Niamh, Dublin, Ireland.